OBAMA SETS FORTH HIS PERSPECTIVE AND AGENDA AND DEFENDS AMERICAN LEADERSHIP WITH OTHERS: WE WELCOME YOUR REACTIONS! “First, let me repeat a principle I put forward at the outset of my presidency: the United States will use military force, unilaterally if necessary, when our core interests demand it – when our people are threatened; when our livelihood is at stake; or when the security of our allies is in danger. In these circumstances, we still need to ask tough questions about whether our action is proportional, effective and just. International opinion matters. But America should never ask permission to protect our people, our homeland, or our way of life. -President Obama in his commencement speech to West Point graduates, May 28. America faces many major challenges in today’s chaotic world. Making sense of them and trying to find solutions is not an easy job, even for most experts and leaders around the world. Soon, President Obama will be visiting Europe both for a key G-7 meeting and also for D-Day anniversary ceremonies. Europe has just undergone elections for a EU Parliament with results that raise many concerns. Along with the United States, Europe must craft an effective response to the Ukraine crisis, build energy security, and respond to a new and aggressive Putin. Not least, it must develop a new global response to climate change and nuclear proliferation. 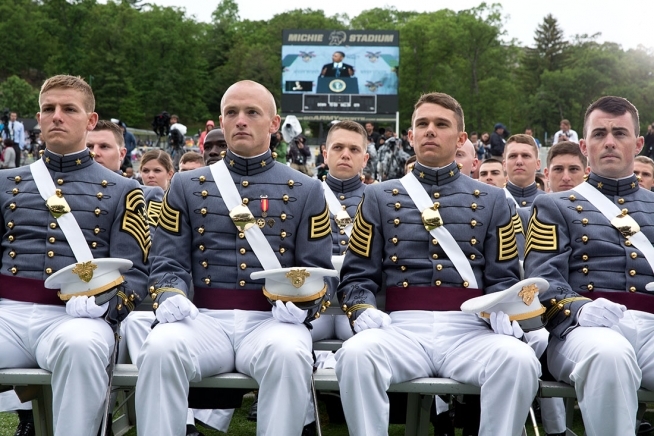 President Barack Obama’s speech today at West Point is the start of an effort to reach out to the American people and explain his policies and objectives. It also signifies an attempt to outline the kind of world that this and future generations will face, and the many challenges that remain of deep concern. During his speech, the President set the parameters for military engagement which in various past statements have been said, but clearly have not been well understood by the public. His speech was also an effort to reach out beyond his critics on both the right and left, as well as those in the mainstream media. Over the past six years, these politicians and observers have attacked the President’s policies so heavily that it has become difficult for American voters to look beyond the criticisms. Indeed, one poll has left him with just a forty percent approval rating in foreign affairs, in no small part due to the carefully crafted criticisms of his opponents. Today, what was notable in his argument was that our foreign affairs and national security efforts have been effective, judicious, and well considered; that the tools used have often yielded better results than U.S. unilateral military intervention that his conservative critics have urged. He said what is clearly true: we remain still the indispensable power in the world and, as such, we bear a large responsibility. Though he continues to support the policy of military action when necessary, the President’s clear preference is to work through what has been called “soft” or “smart” power. That is, he continues to prefer cooperating with allies, friends, and international institutions like the UN on a multilateral level. We are asking our readers to provide comments on the speech and President Obama’s priorities and goals, as well as their view of the challenges of our international landscape and direction American should take to deal with the key issues that Obama has outlined. For a link to the full transcript of today’s speech, please click here. Again as always we welcome your comments and perspectives. Please join our dialogue! Previous Article EUROPEAN ELECTIONS: WHERE WILL EUROPE GO NOW? I hesitate commenting on the President’s speech, as I am not privy to the policies and details that motivate and direct our actions. That said . . . I look at our foreign policy over the last dozen or so years and I question what we’ve accomplished. And, in the instance of the President’s speech, I question some of his premises. Permit me a couple of for instances: One, if our military is without peer, in that we have been in Iraq and Afghanistan all these years, have we brought either peace and stability? Two, the President talks of a dynamic, innovative economy. How is the housing industry doing? Where are America’s machine tool manufacturers? Do we make TVs or bearings or clothes these days? Why are our industries spending less on research? And, how dynamic is an economy in which finance is larger than manufacturing and one third of all profits go to Wall Street? The perception of greatness too often relates military strength, and, if I read the speech correctly, the spread of freedom will make the U.S. and the world safer. The President used the term ‘moral imperative.’ I suggest the world will be better if people and nations prosper. Would the ethnic Russians in Ukraine be revolting if Ukraine had been prospering? Freedom itself won’t cut it. This administrations foreign policies have not been err free, but compared to the preceding administration . . . excuse me . . . there is really no comparison. The Obama administration, on the whole, has a rational, forward thinking foreign policy. In that terrorism seems to be our biggest threat, rather than spend five or ten billion training anti-terrorism agents in foreign countries [which surely will be questioned by Congress) . . . now that terrorism exists, to what lengths do we want to go to stop it? We have more secure food and drug containers, police stand guard at schools, we take off our shoes and then get X-rayed before getting on a plane, we went to war in Afghanistan, and what have we stopped. We will get struck again, so I ask two questions: One, how resilient are we to terrorist attacks? Two, why are terrorists striking at us? Could it be that they don’t like us because of who we’ve supported (think dictators) and what are intentions have been? It is a complicated world and the U.S. is a major player. But if our foreign policy goal is to promote world peace, I think we need to think and act a lot smarter than in the past. The mistakes we’ve made visa vis the Soviet Union/Russia are monumental, and now we’re paying for it. We can lead, but not by dictating. We can lead through understanding and accommodation. If peace among peoples is ever to happen, it will be because the people are satisfied with their lives. How’s that for a goal? Thank you for the excellent set of questions! On the question of what we have accomplished over the last dozen years, I will only respond here about the Obama administration’s actions and policies. First, we got out of the quagmire and tragic, wrong-headed war in Iraq. The alternative is that the Iraq Republican Hawks would have us still there with many added American deaths, many resources lost, and likely little gained. That was an accomplishment of major proportions. Second, the New START agreement lowered both American and Russian nuclear weapons. Third was the pivot to Asia. This was long overdue given the region’s importance and our longstanding need to effectively address China’s rise, work towards its “peaceful” rise, and strengthen our allies and friends in the Pacific. Fourth is the initiatives of the Pacific and Atlantic trade pacts to increase trade and economic growth in all of these regions including in the U.S.
Further, Obama has developed a process of withdrawal from Afghanistan, after getting rid of bin Laden and severely dismantling the Taliban. But of greatest importance, Obama has put America on a path of international cooperation with others (including international organizations) to solve global problems, and he has been careful not to engage us in conflicts that likely can have no certain or good end. He has NOT abandoned American leadership as some have argued. (See some of the quotes in this blog). Indeed America has never been as active around the world as we are today. We now use a diplomatic front with the military as an option, often in low profile. On the question of some of his premises: having a military without peer does not guarantee success in wars between religious and ethnic groups (often called “asymmetric wars”), and at last we have a president who understands that. Other long-term tools are being used here, like economic aid. On the question of economic growth and the modernization of our industrial and civil infrastructure: given the reliance of the right-wing Republican party on the word “No,” and its push to defeat Obama and health care for more than 8 million Americans in the last election, it is no surprise that much of Obama’s efforts to “restart and stimulate” our economy went down in flames. (Except, remember, that he did get a limited stimulus supported largely by the Democrats who were then in charge of Congress and by a few moderate Republican Senators. This gained us back 7 million jobs, saved our auto industry, and for a period added resources for infrastructure, clean energy, teachers, and the unemployed that helped boost our economy and take it out of the recession.) Today, he will announce carbon limits that address global climate change. Given his opposition, these are small miracles. However. I agree fully with Mr. Lamoree, that we need to do more to bring America to full global competitiveness. He has proposed legislative packages to that end which the Republicans have filibustered to death.